You may have seen it. The colourful assembly of iconic food images on the cover is hard to miss. With the same cover design, the fifth edition of Understanding Codex is now accessible in four of the six official UN languages on the FAO/WHO Codex website – the remaining two are coming soon. The publication has been updated to help readers better understand how the Codex Alimentarius Commission works, how it facilitates the food trade, benefitting economies and livelihoods, and what it means to all of us as consumers. For more than five decades, Codex standards, guidelines and codes of practice have contributed to the safety and quality of the food we eat, the publication explains. The Codex Alimentarius, or ‘food code’, forms a global rule book for food safety from production to consumption. Its provisions concern food hygiene, food additives, residues of pesticides and veterinary drugs, contaminants, labelling and presentation, methods of analysis and sampling, and import and export inspection and certification. Understanding Codex describes the intricate but open and participatory standard-setting procedure the Codex Alimentarius Commission (188 Member countries, the European Union and 225 Observer organizations) uses to deliberate science-based evidence and adopt the texts. In this new edition, the Codex Administration section has been expanded to include the function of the Codex Chairs and Vice Chairs; the chapter on trade now opens with the Codex implications for the international food trade; the final chapter sets forth the Sustainable Development Goals with which Codex work is aligned; and overall the contents have been condensed to facilitate finding information more quickly. 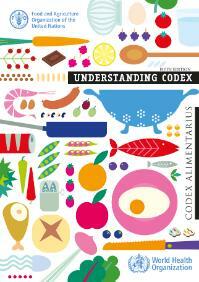 “This publication provides an ‘easy-to-understand’ and user-friendly introduction to Codex, which I believe is helpful for many types of audiences,” said Hilde Kruse, Senior Food Standards Officer at the Codex Secretariat, noting that along with the rise in the international food trade has come greater interest in Codex standards. The Codex Alimentarius Commission, established by FAO and WHO in the 1960s, is dedicated to protecting health and facilitating trade.